The bat and ball game of cricket is played with 2 teams of 11 players on a field, in the centre of which are two wickets set at each end of a 22 yard long pitch. One team will bat first, and it is their job to try to score as many runs as they can while the opposing team field. Every phase of play is an “innings”, and each innings ends when the ten batsmen on the batting team have been dismissed or, alternatively, a set amount of overs have been completed. At this point, the teams will swap roles and play continues. The team which scores the largest number of runs during their innings is the winner. The ICC (International Cricket Council) and MCC (Marylebone Cricket Club) maintain the laws relating to cricket and there are several formats of the game. Usually, cricketers play in a white kit and sometimes, protective gear is worn to guard against accidental injuries caused by the cricket ball, which is made from compressed leather around a cork core. The origins of this sport are not certain, however the first recorded mention of cricket dates from the 1500’s. Cricket was probably originally a game for children, however adults had begun participating by 1611 with the first village cricket match being held around that date. During the 1700’s, the game went through several developments, with rich patrons creating their own teams. Large matches were held from the middle of the 18th century in Finsbury with crowds attending to cheer on the teams. In 1760, bowling was changed from rolling into pitching and a straight bat was introduced instead of the existing hockey stick shaped one. In the 1760’s, the Hambledon Club was founded and it remained the focal point of the sport until the MCC was formed in the 1780’s. Other changes during the later half of the 18th century included the introduction of the LBW rule and the arrival of the three stump wicket. Its popularity soon spread as the British Empire expanded, and international matches were first held during the 19th century. This era saw overarm bowling supersede the underarm style and county clubs began to be created, with the first being founded in 1838 in Sussex. The 19th century’s best known player was W.G. Grace who began his career in the sport in 1865. The first Test Match took place in 1876-1877 and the rivalry initiated between the Australian and British teams led to the creation of The Ashes in 1882. The Golden Age Of Cricket took place just before the First World War, when many memorable matches were played and many great players were in the field. By 1963, cricket had entered a new era with the introduction of the Limited Overs variant which increased the number of matches. Another new form of limited overs, the Twenty20 was more recently introduced during the 21st century, which also impacted upon the sport. At the beginning of the game, there are 11 fielders and 2 batsmen in the field of play and the play starts when the bowler throws the ball down the pitch to the opposite wicket where it is hit by the striker, whose job it is to stop the ball from hitting the stumps. The batsman at the other end of the pitch is the non-striker. When a batsman is dismissed, he is replaced by a teammate and play goes on until each player has taken a turn while the bowler tries to stop the batsmen from scoring runs. Each bowler delivers six balls (this is termed an “over”), before a different bowler takes over to bowl the next over from the opposite end of the pitch. There are several rules relating to dismissal from the game. Batsmen can be dismissed by being bowled i.e. by the ball hitting the stumps, through the LBW rule (leg before wicket), where the batsman hits the ball with his body and not the bat, or by being caught out, when the fielder catches the ball after it is struck before it hits the ground. A run is scored by either the batsman hitting the ball over the boundary or when the batsmen simultaneously swap ends while the fielders retrieve a hit ball. Cricket has several formats and is a multi-faceted sport depending on the standard of play, the level of formality required and the desired time frame of the match. In professional cricket, there are two main types of matches – those that are time limited to two innings for each team and those that are limited by overs numbers, with just one innings per team. The first option is known as first class cricket and it typically takes place over 3-5 days. The second option is known as limited overs cricket and generally lasts for just one day unless there is bad weather or some other reason for delay. A two innings match will generally have a minimum of 6 hours of play every day of the match. A limited overs match will usually last around six hours, or maybe more. Each day will usually see a formal interval for lunch and tea as well as shorter informal breaks to take drinks. Between innings there is also usually a brief interval. 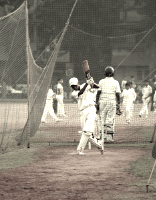 In amateur cricket, a match rarely goes beyond a single day’s play. Amateur match types are either a declaration match which assigns a specific number of overs or a maximum time period for the game, with the teams swapping over when the batting team is dismissed, or a limited overs match which assigns a specific maximum number of overs for each team. This type of match will last for between 30 and 60 overs for each side when held over a weekend or 20 overs for each team during an evening game. There are other forms of cricket too which are also popular including garden cricket and indoor cricket.